Imitation is the sincerest form of flattery, but other times it's just an excuse to show off new tech. This may have been the case for Reddit user sp00kens when they started working on a remake of 2002's Super Mario Sunshine in Unreal Engine 4. While not a total remake of the GameCube platformer - on top of the sheer amount of time it'd take, Nintendo's lawyers would probably have a few words on the matter - the project plans to give Sunshine's tropical hub world, Delfino Plaza, a next-gen graphical makeover. Beyond recreating the Plaza, the fan-made redux aims to include a few extra levels, as well as full textures, lighting and music. It's not entirely clear how far the game will go to copy the original in terms of gameplay, if there will be any. Despite intending to recapture the original Delfino's architecture, the current build of the fan project was actually ripped from the Delfino Plaza stage in another Nintendo game, Super Smash Bros. Brawl. Building up on that original skeleton, sp00kens offered another sneak peek of the project's progress, showing off some water lapping against the interior port of the Plaza. While the water's graphics are visually strong, there seems to be a little extra "something" missing. The level is far from finished, granted, but we think that speaks more to how impressive the original's water was, despite being nearly a decade-and-a-half old. The video below delves into how the game's developers made the water as dynamic as it was. 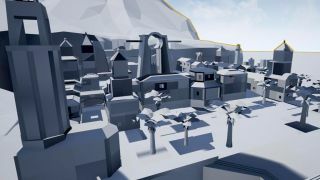 Fans recreating their favorite titles on Epic's game engine has become a sort of fanart, with classics like GoldenEye or Mario's moves in Super Mario 64 getting a modern paint coat thanks to Unreal Engine 4. For the most part, fan remakes often wind up as little more than labors of love, with a side helping of practice. That said, projects like this could wind up being something special, as is the case with the upcoming Half-Life 2 fan game that's become a legitimate sequel. Could the Nintendo NX handle Unreal Engine 4?